Discussion in 'Online Games - News and Reviews' started by Marina, Jan 5, 2014. Lucky Koi is another fantastic video slot released from Microgaming. 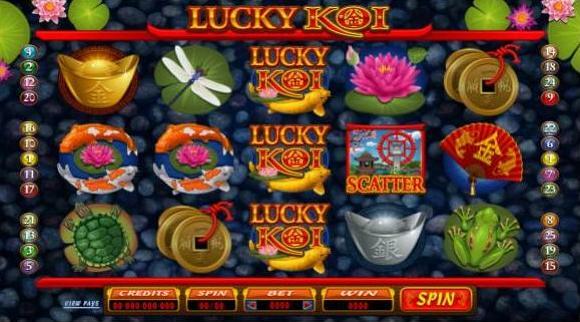 This Asian themed video slot features the Koi fish. Koi fish have become increasingly popular in home ponds all over the world. The inspiration of these fish dates back thousands of years ago that they are believed to hold magical and mystical powers by transforming themselves from fish to dragons. They symbolize perseverance and endurance and it's with that idea this video slot was created. 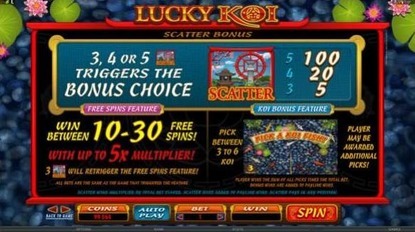 Lucky Koi Online Slot will bring you great fortune along with free spins and a bonus round. along with the number of coins they choose per spin. Bet amounts will vary dependent on the players choice. All wins pay left to right except the Scatter symbol. The Wild symbol is the Lucky Koi logo symbol and substitutes for all symbols except the Scatter symbol and can be stacked to increase your winning combinations. You can get a winning combination with only 2 Scatter symbols or 2 Wild symbols. The highest payout will be grand. 5 Lucky Koi Logo symbols, 5 Lucky Koi Wild symbols or tow Koi fish are your goal for the grandest win. They bring in the highest payout. If you receive 3 or more of the Scatter symbol anywhere on the reels, this starts the feature of the game. Players may choose free spins or a pick me feature. Choosing the free spin feature will award you 10 to 30 free spins with random multipliers up to 5x's. This feature can also be re-triggered by receiving 3 or more additional Scatter symbols. If you choose the Koi Bonus Feature, you will have a chance to pick between 3 and 6 Koi fish for prizes. You may also be rewarded additional picks. Microgaming has brought you another great online video slot with Lucky Koi.